Sixty-eight years ago, the United States dropped an atomic bomb — the first of its kind — on the Japanese city of Hiroshima. In the over six decades since, that action is still seen as justifiable on the grounds that it helped to end the war and avoid what would surely have been the death of countless Americans given a land invasion. The American people have consistently and overwhelmingly supported the action as well. 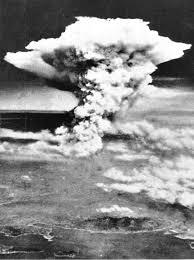 However, as far as I am concerned, the United States government and the people that continue to buy into its narrative about the use of the atomic bombs, have blood on their hands. It was one of the worst atrocities ever committed in warfare. 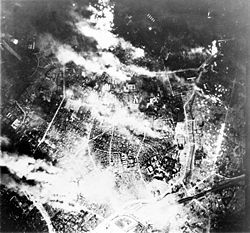 Some will point to how the U.S. and British governments partook in firebombings that leveled city after city in Germany and Japan that were much worse than the two atomic bombs. And that’s somehow a defense of the two bombs dropping? Moreover, at the least, with the firebombings, there isn’t the after-the-fact deaths from radiation poisoning. It doesn’t matter if Japan “started it,” either. Only individuals have rights, not nations. 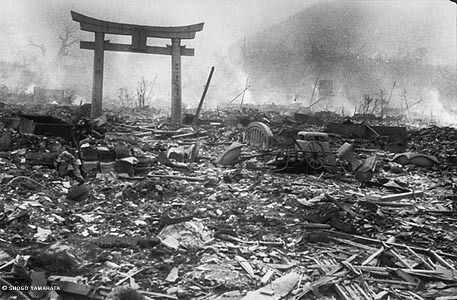 Unless you can prove that every single Japanese snuffed out at Hiroshima and Nagasaki was involved in the Pearl Harbor attack, the murderousness of the bombings is indisputable. Even the official history should doom Truman to a status of permanent condemnation. Besides being atrocious in themselves, the U.S. creation and deployment of the first nuclear weapons ushered in the seemingly endless era of global fear over nuclear war. 58.0% of Yokohama destroyed like 58% of Cleveland destroyed. 51% of Tokyo destroyed like 51% of New York destroyed. 99% of Toyama destroyed like 99% of Chattanooga destroyed. 40% of Nagoya destroyed like 40% Los Angeles destroyed. Part of my fascination was personal. I’d been teaching at a few Japanese junior and senior high schools that year where the boys wore the very same jackets to class each day, with their formal high-necked collars and rigid lines projecting a sense of adolescent duty and conformity. But it was also the one artifact that made me imagine being that specific boy on that specific morning, buttoning up that jacket and walking to school, and what it might feel like to have your body blown apart from within, as if the bomb had detonated inside your chest and bowels. That’s horrifying to me. After sixty-eight years, a few generations and the advent of new and more terrifying weapons, I would imagine we would be trying to washing this blood off our hands instead of holding them up and saying, “Hey, we did what we had to do; we did the right thing.” Maybe one day…just maybe.